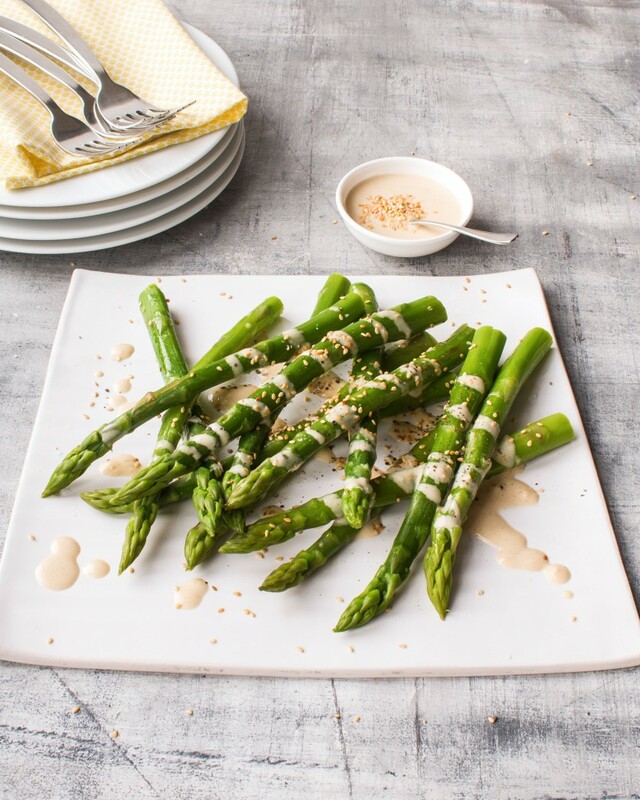 Bring a large pot of salted water to boil and blanch the asparagus for 2-3 minutes. Drain and place in a bowl of ice-cold water. In a small bowl, combine the tahini, crushed garlic, olive oil and honey and mix well. Gradually whisk in the lemon juice until emulsified. If desired, thin the sauce by adding 1tbsp water and stirring well. Season with salt and pepper to taste. Place the sesame seeds in a dry frying pan and toast until just browning. Make sure to keep moving the seeds around the pan to stop them from catching. Once toasted, set aside to cool. Place the asparagus on a small serving dish and drizzle over the tahini dressing then sprinkle on the sesame seeds.